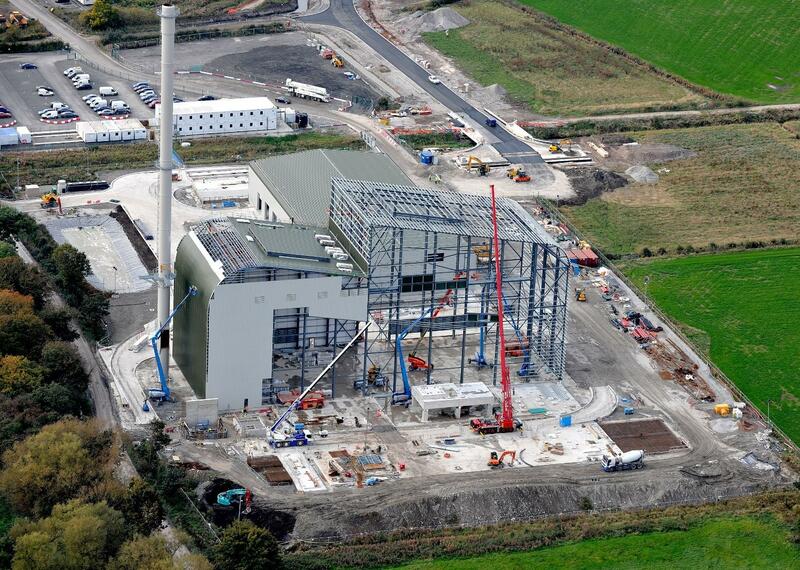 Ward & Burke were responsible for the design and build civils works for Ince Park Biomass Power Resource Recovery Centre (20MW Plant), located in Cheshire on a previously undeveloped site. Completion of further site investigation allowed for detailed design of the piling matt and piled foundations. Design and build 24,000m2 of a piling matt x 1.2m thick with 4 layers of geogrid. Equating to 60,000t stone. Design and build piled foundations which involved the installation of over 1100 number 350 square precast concrete piles x 16.5m to 17.5m deep. Design and construction of fuel reception building, gasification building and turbine hall and admin building. In order to gain time on the programme Ward & Burke suggested constructing the building in advance of process plant installation to the client. We designed 2 large 15m x 15m removable openings in roof for plant installation. We also identified abrasion resistance risk in the reception hall floor, due to loading shovel and decided to use special concrete mix with micro silica, called Diamondcrete to provide AR0.5 abrasion resistance. In order for the Biomass Facility to be up and running on time to meet ROCS compliance date, the programme was critical. The main supplier of the gasifier/boiler was late with loading information, in order to maintain programme, we developed, not to be exceeded, loading drawing verified by the FE model. The project was delivered on time despite information delays.